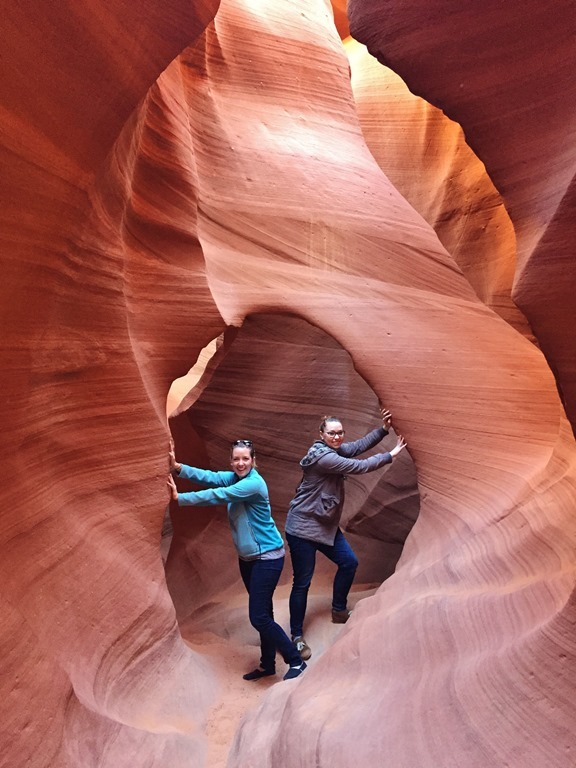 Like many Great American Roadtrippers, our itinerary consisted largely of state and national parks. You don’t have to share Leslie Knope’s enthusiasm to understand that there’s good reason. The US park system has taken some of the most beautiful, unique, and delicate natural landscapes in the country and preserved them for everyone to visit and enjoy. Can you imagine if the vistas of Bryce Canyon were peppered with houses and office buildings? Despite all that, we also made a fair few stops outside of the park system which were equally incredible and noteworthy. One of those was Antelope Canyon. 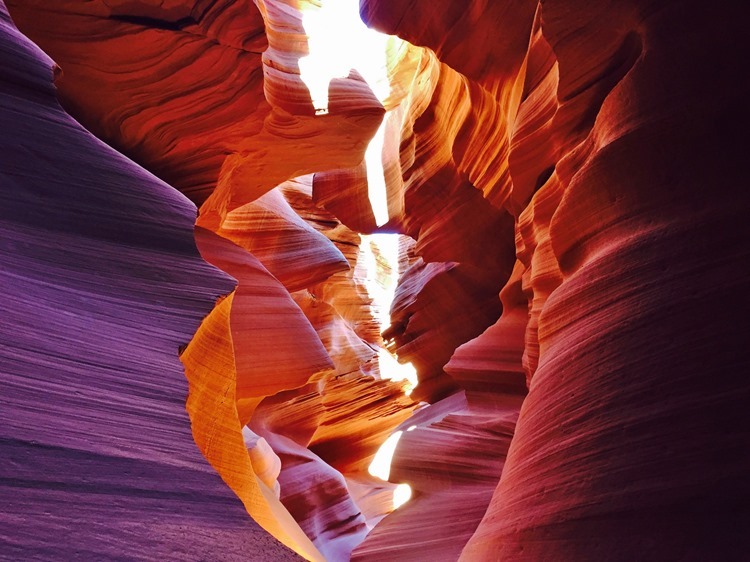 Antelope Canyon is located on Navajo Tribal Park land just a few minutes outside of Page, Arizona. 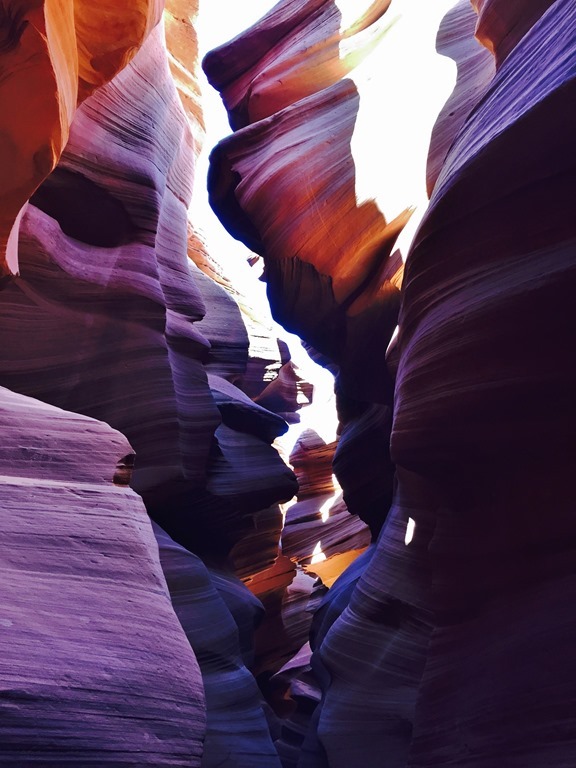 In years past, visitors were allowed to wander through on their own, but the canyon is now accessible only with an authorized tour guide – unless you’re a professional photographer. 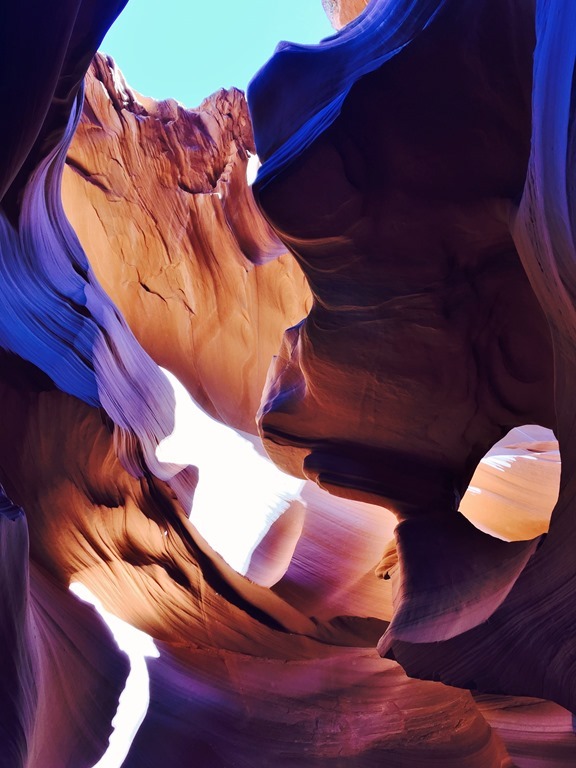 There are two sections of Antelope Canyon, Upper and Lower. 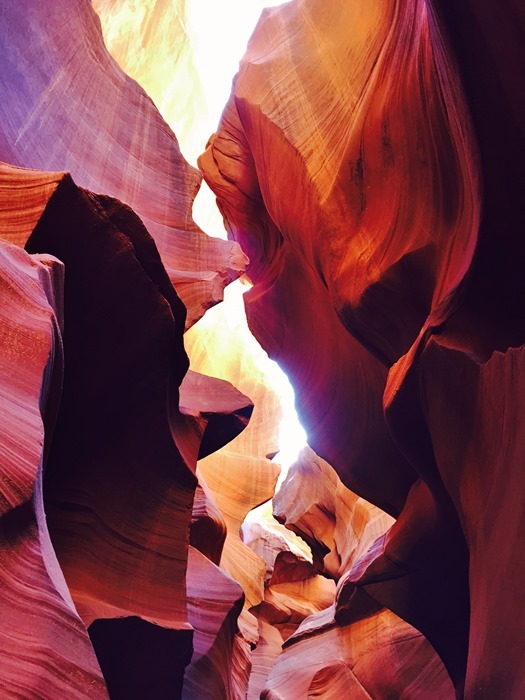 Though both are made of similarly spectacular formations in the Navajo Sandstone, Upper Antelope Canyon is an easier, wider walk – it’s in the shape of an “A,” whereas Lower Antelope Canyon is in the shape of a “V” – so it’s the more frequently visited, and therefore more expensive, option. So naturally we went for the other one. We showed up at Ken’s for the first tour of the day under cloudless blue skies. The place seems like a random turn off of a nondescript road into a parking lot like any other. It’s amazing to think how easily you could drive past without realizing what’s right next to you. Amity and I milled around as four or five other people collected for our tour group and finally our tour guide, Broderick, appeared. 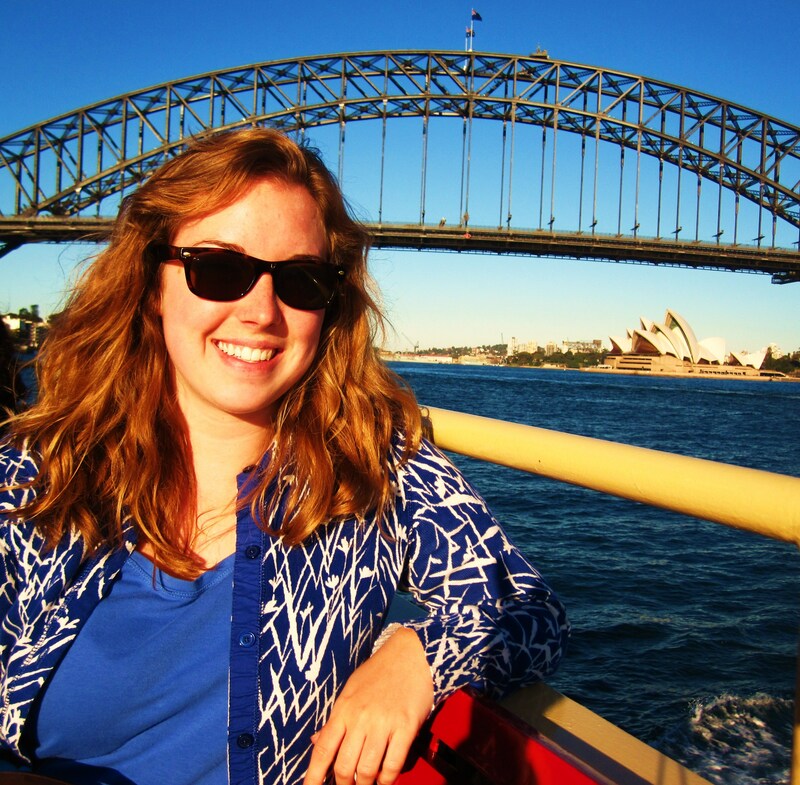 Now, you all know we’ve had some pretty excellent luck with tour guides in our time. Billy. Ernest. The guy in London who signaled us with a bottle of blue Gatorade instead of an umbrella. Broderick might just take the cake (okay, he’d share it with Billy). Tour guides are a special breed anyway, I’m convinced of it. Broderick was half-Navajo (he even taught us a few phrases which I promptly forgot), a quarter Mexican, and a quarter Swedish (which is where he got his nose, “like a little ram,” as his grandfather apparently says). He was quiet at first but quickly started opening up and joking with us, explaining that people on TripAdvisor ask for his tours specifically. Okay, enough about Broderick (not! there will be more). 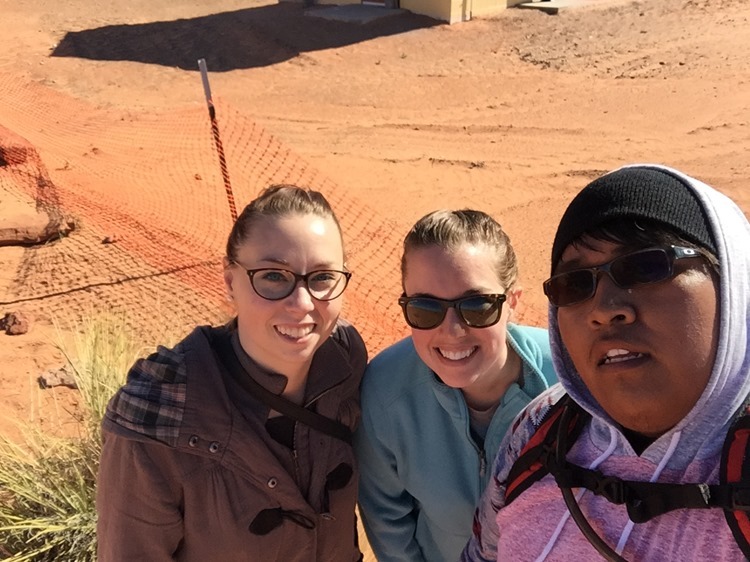 Our little group walked a short ways out into the desert, watching our footing in case the canyon suddenly appeared in front of us. You can hardly see it! 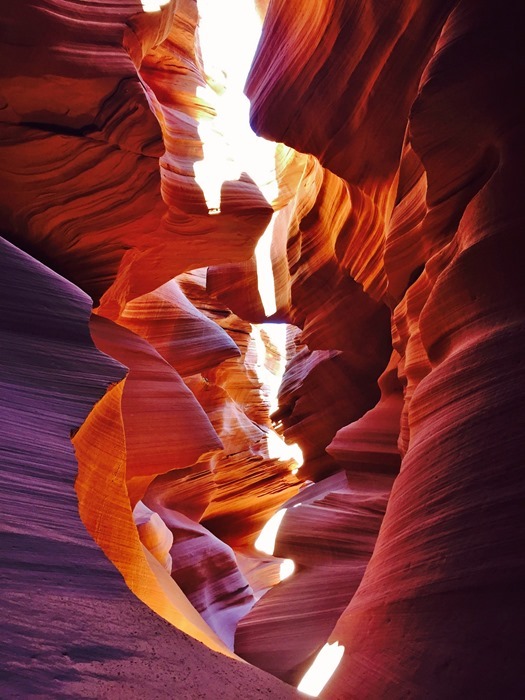 Antelope Canyon is a slot canyon that was formed by flash floods which carved a narrow path through the smooth, soft sandstone. 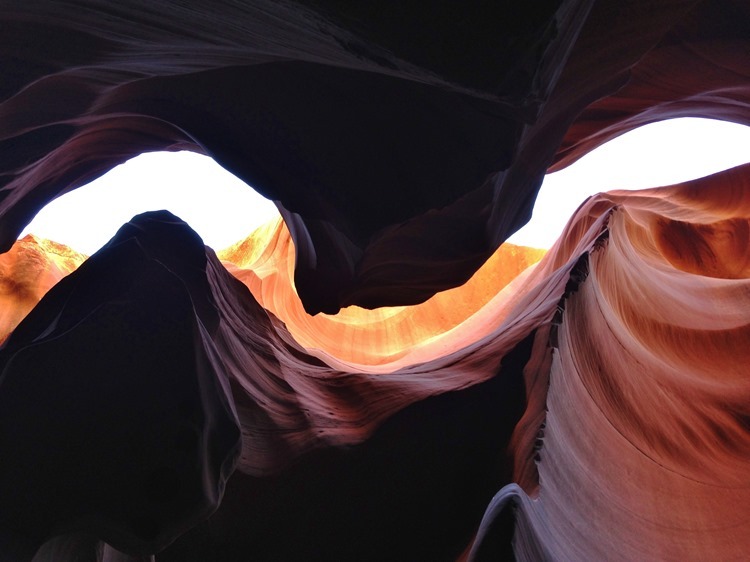 As we descended the metal staircase to the entrance of Lower Antelope Canyon, the reasoning behind its nickname “The Corkscrew” (Upper Antelope Canyon is called “The Crack”) became immediately apparent. 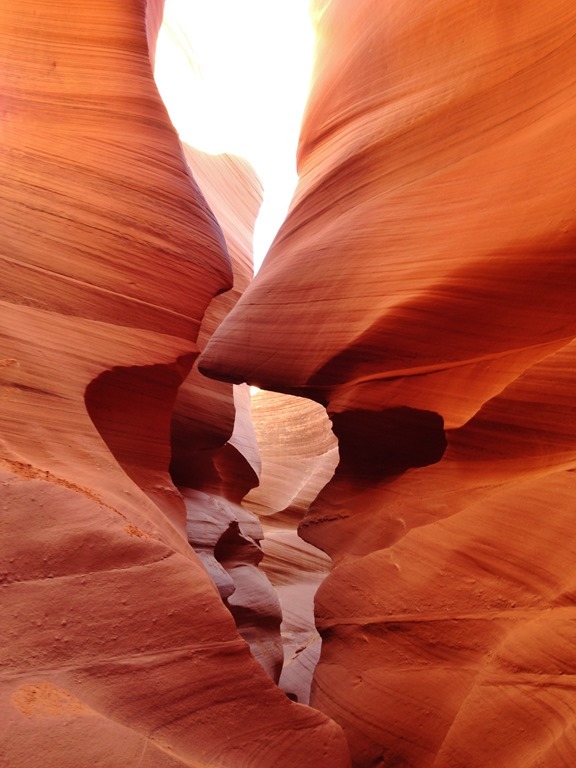 The canyon twists and turns so much that even I can’t tell which way is up in a lot of my photos! It helps to put people in there for reference. 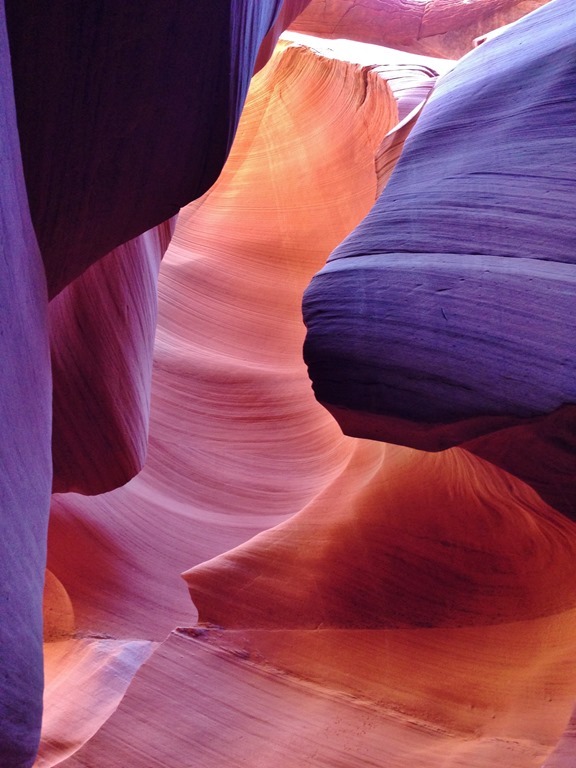 Because the opening to the canyon is so narrow, the light is really varied and creates all these incredible colors out of a mostly uniform material. 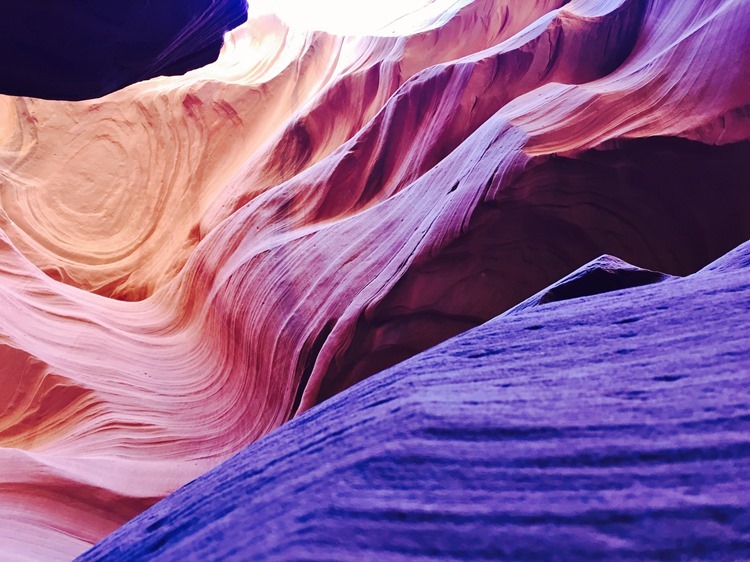 The sunlight and shadows turn the sandstone every shade on the spectrum from neon orange to deep purple (smoooooooke on the waaaaterrrrr… just me?). 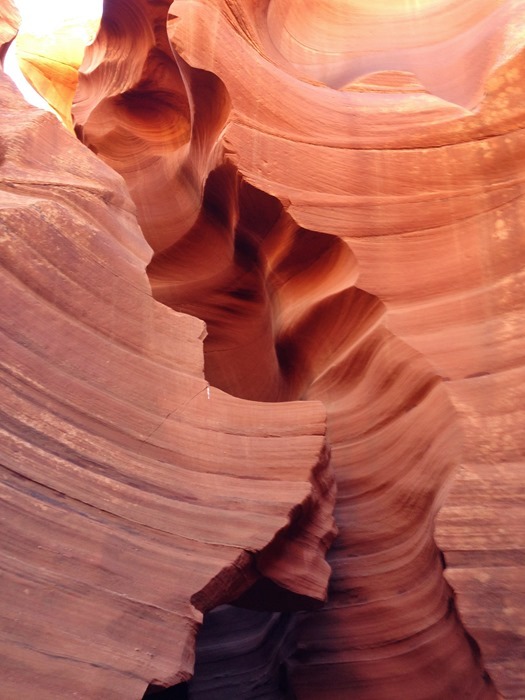 ^ You can really tell how narrow the bottom of the canyon is in places. It looks like Amity is growing out of the ground. A little desert flower! 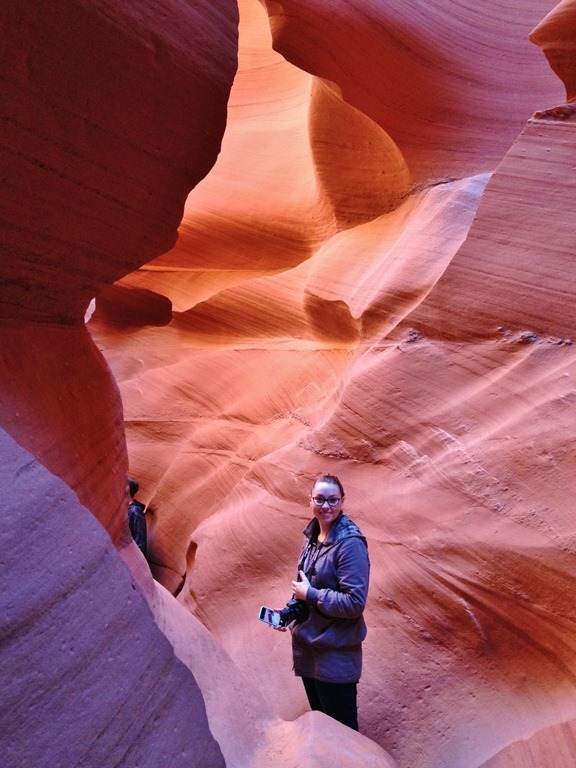 Despite the vibrant colors, the level of light within the canyon was overall much lower than above ground, and our eyes took a while to readjust to bright sunshine afterwards. For photos, this meant that it was nearly impossible to get a shot where the sky wasn’t completely blown out (without professional camera equipment, of course), so I took any snap with a bit of blue in it as a triumph! Because the top of the canyon is so narrow, it’s rare that sunlight is able to penetrate directly to the ground without bumping into rocks in between. 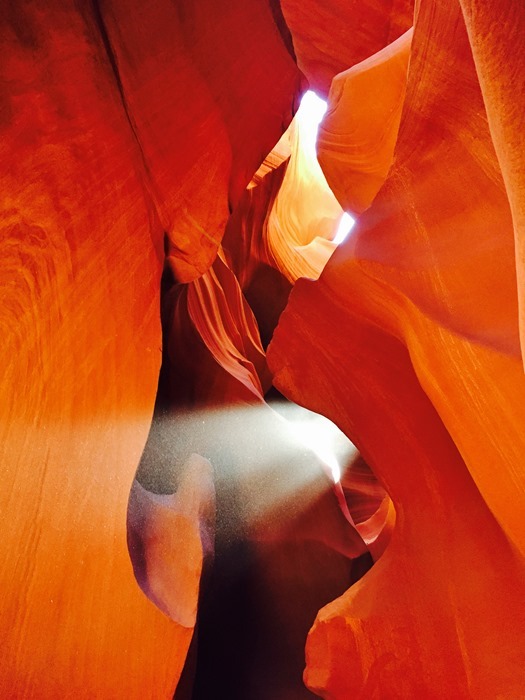 When this does happen, it creates perfect sunbeams which are thrilling to spot and one of the main draws for photographers to the canyon. Upper Antelope Canyon generally has many more sunbeams than Lower, which is another reason it’s more popular with visitors. Even though we were there towards the beginning of the winter season, when sunbeams are uncommon because the sun is lower in the sky, we were lucky enough to capture one near the end of our tour. 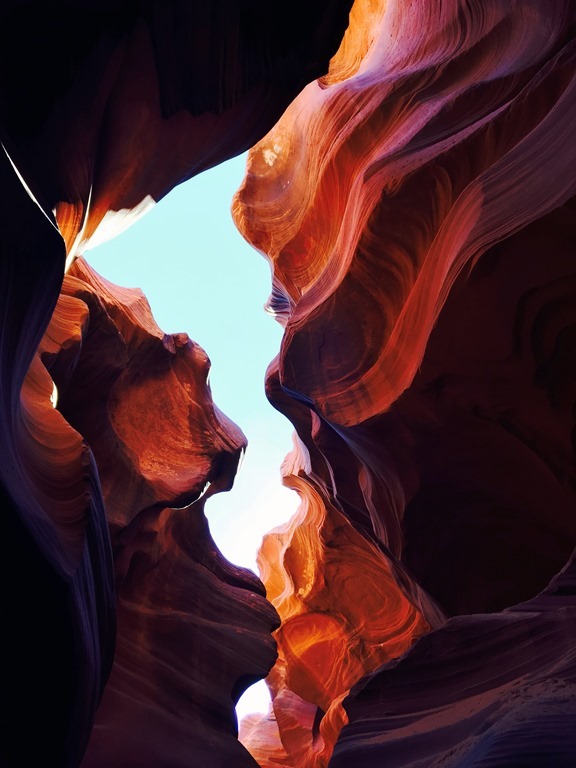 Peter Lik, the professional photographer behind most of Windows Vista’s desktop background pictures, is a frequent visitor to Antelope Canyon. In fact, he recently sold one of his snaps of a sunbeam here for $6.5 million, making it the most expensive photograph ever sold. So, not a bad day’s work for him. Yet another of Broderick’s countless admirable qualities was that he was in the final year of his photography degree, so he spent plenty of time helping us all adjust the settings on our various phones/cameras, pointing out the best vantage points, and even lining up shots and panoramas for us. 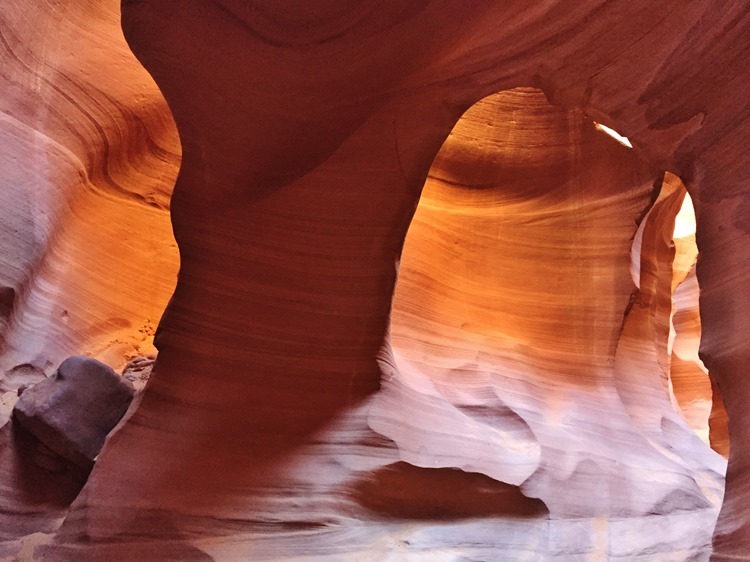 The most fascinating bit of our tour of Lower Antelope Canyon was learning about its discovery. It was first found in the 1930s by a young Navajo girl who saw an antelope suddenly disappear while running in the desert. 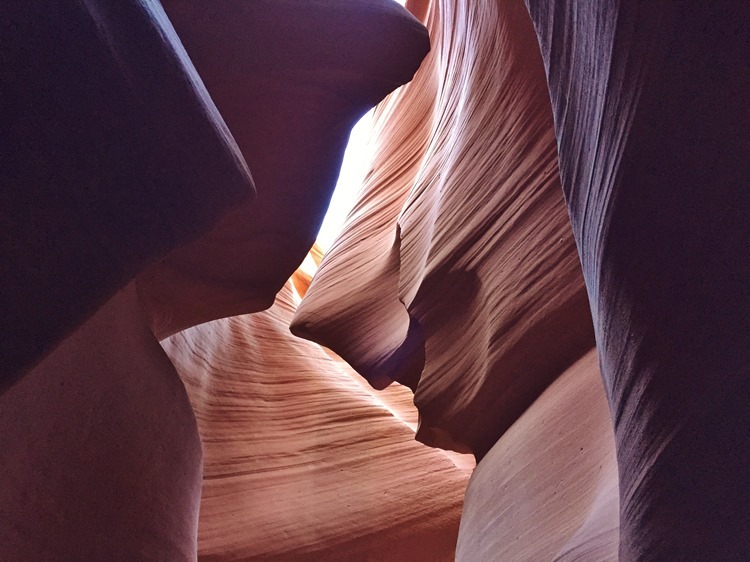 She investigated and realized that the antelope had actually jumped into the slot canyon (hence the name), which is nearly invisible from above ground. 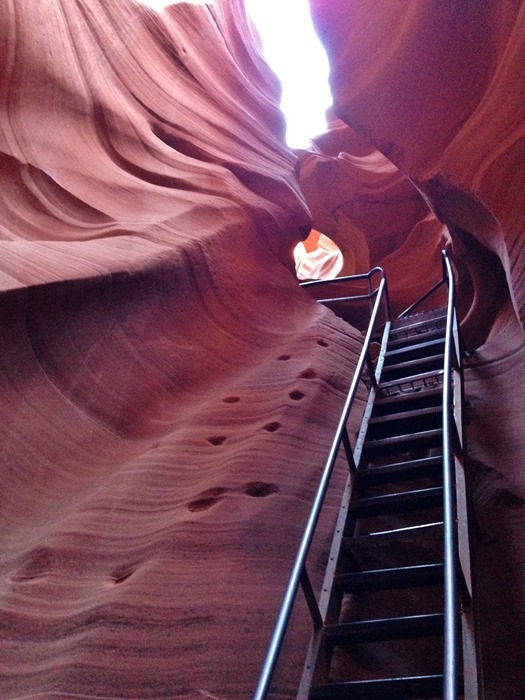 Without the help of ladders or stairways, the little girl climbed down in to the canyon and began to explore. The best part of the story is that she kept the canyon a secret for 30 years without telling anyone else. Can you blame her? Just imagine stumbling upon this place as an 11- or 12-year-old. It would be like your own underground make-believe world come to life! The footholds she dug in to the stone decades ago are still visible next to the more recently installed stairs. Can you see either of them? We spent over an hour navigating the twisting corridor of rock, despite the fact that we walked less than a mile! Every step presented a different angle or view. After such an excellent experience, there was nothing else to be done except to take a selfie with Broderick and be on our merry way. 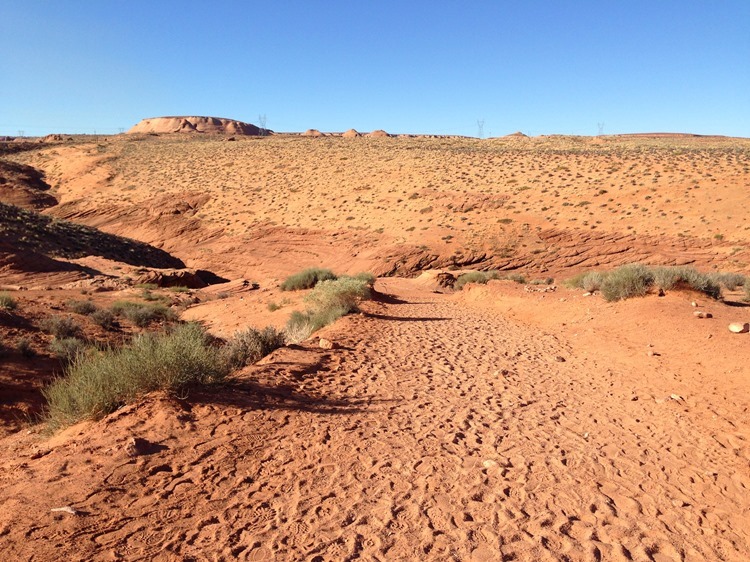 There are a handful of independent Navajo tour companies (more in Upper than Lower) to choose from. With all of them, ticket prices may be higher during more popular times. 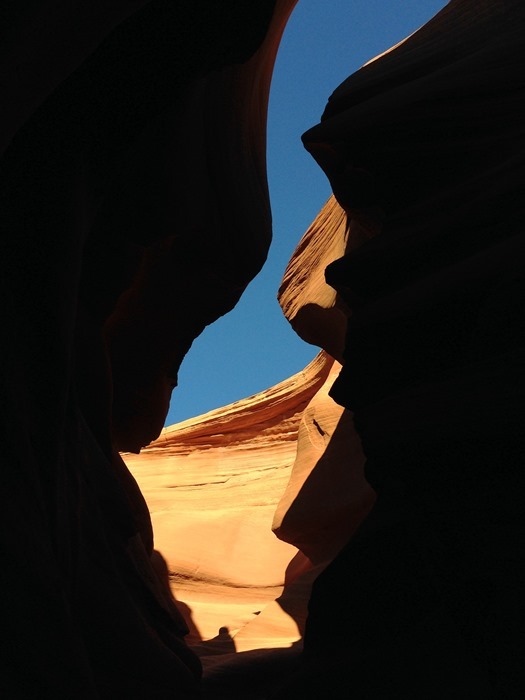 We were really happy with Ken’s in Lower Antelope Canyon – find them HERE and ask for Broderick! Oh wait, one more thing. Here’s a GIF of Amity being born from the canyon. You’re welcome. This is definitely on my bucket list! I can only imagine what it is like in person! Love all your pictures! Thanks! It was SO cool. I was hesitant because the price was much steeper than our other activities, park entries, etc. but I’m so, so glad I got talked into it! Wow. This is so amazing! The rock formations look like waves, as though it’s water made out of rock somehow. And the colours / light are incredible. Definitely pinning this for a road trip idea! It’s almost otherworldly, isn’t it? 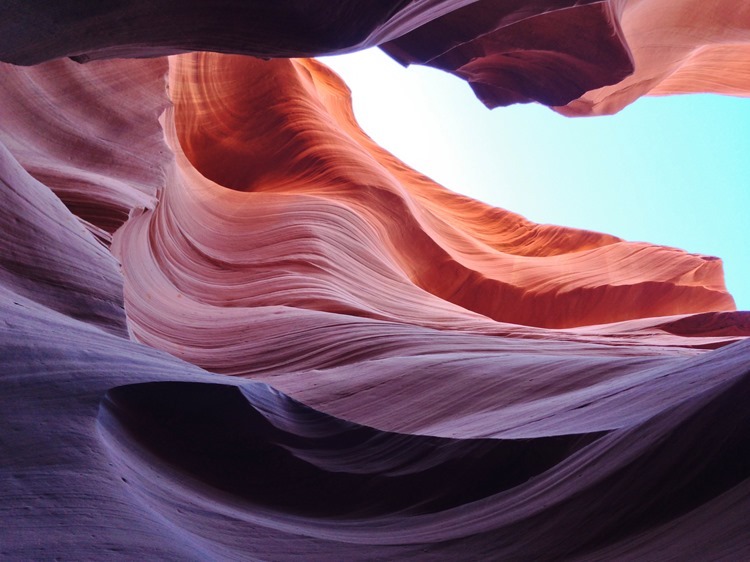 There’s another sandstone formation not far away that’s actually called The Wave (Google it, it’s incredible), but it’s gotten so hugely popular that only 20 people are allowed in per day and you have to enter a lottery to get a spot. I’m glad we went with Antelope instead! 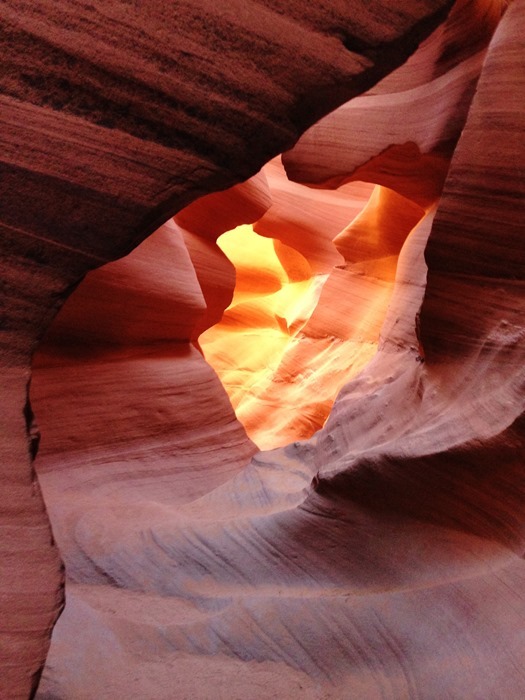 I LOVE Antelope Canyon! It’s definitely one of the coolest places I’ve been in the US. I need to go back someday for some better photos, though (and just because, well, it’s awesome). Julie, I’m loving all of your road-tripping posts! I have been itching to go on a road trip lately and this is making me want to just hop in the car and drive. I have always wanted to go to Antelope Canyon and I wish I had made the trip while I was in UT. You took some amazing photos! DAVE! Thank you so much! I think you definitely need to put Antelope Canyon on the list. We also did Arches but never actually made it to Moab like you suggested (van troubles messed with our schedule!) so I’m really hoping to get back out west for round 2 at some point! That’s too bad about the van trouble, but I’m glad you made it to Arches! There’s really no other place like it. What for an astonishing place ! I loved your animated GIF at the end of your post, really cute, thank you for sharing your pictures. You told the activities were expensive, but my view it’s the price to pay to see so beautiful canyons ! How lucky you are ! How awesome! I’d suggest getting on the first or last tour of the day so you can see some sunbeams – the slanting light is key so they don’t appear as much when the sun is right overhead. 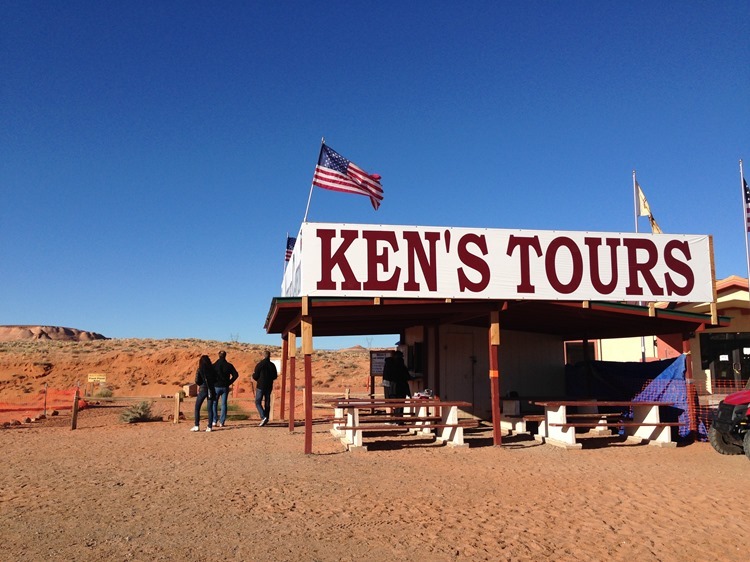 My experience was that guides take it really slow and let you snap tons of photos along the way – and I’d definitely recommend Ken’s Tours for Lower, and ask to go on one of Broderick’s tours! He was so helpful with photos. Can’t wait to hear how it goes! Fantastic photos and trip report! I hope to make it here next year sometime – have been to AZ/UT a handful of times, but not Page…yet!